Aaron Sorkin’s Syracuse recycled commencement speech also had lines from The West Wing and Sports Night. 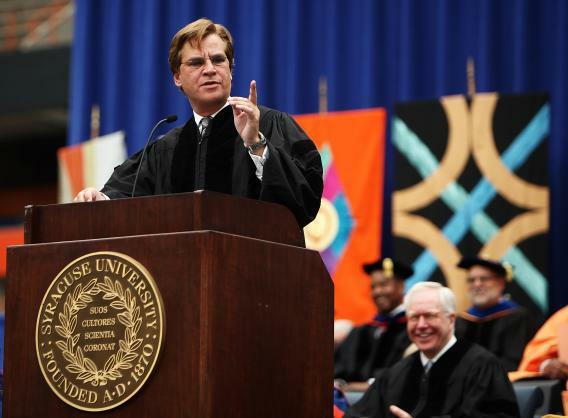 Aaron Sorkin delivered the commencement address at Syracuse, his alma mater, this past Sunday. Judging from the applause in the video below, it went quite well—which comes as no surprise, of course: Sorkin, with his love of rhetoric and anecdotes and aphorisms, not to mention his proudly worn idealistic streak, was born to give commencement addresses. One student at Syracuse was, however, less impressed: Chelsea DeBaise, writing in Monday’s edition of The Daily Orange (“the independent student newspaper of Syracuse, New York”), pointed out that Sorkin recycled more or less wholesale a speech he gave at another Syracuse ceremony, the 1997 convocation of Syracuse’s College of Visual and Performing Arts. Sorkin repeated that story “nearly word-for-word,” DeBaise says. She does not note that the phrase “Welcome to the NFL” also appeared in the first season of The West Wing. Of course, that’s a common phrase (so common that no one, it seems, knows who said it first). But it’s just one of at least four lines from the speech that also appear in the first four seasons of The West Wing, which were written almost entirely by Sorkin. Two of those lines are, like the NFL quip, popular quotations that Sorkin clearly loves. “Don’t ever forget that a small group of thoughtful people can change the world,” he said on Sunday. “It’s the only thing that ever has.” He didn’t mention that the remark was first made by Margaret Mead—probably because he doesn’t need to, really, so well-known is the line. President Bartlet doesn’t attribute it either when he quotes it to Will Bailey in Season 4. Sorkin also did not attribute the line “Decisions are made by those who show up” to anyone else. That’s understandable, since it is variously attributed to Harry Truman and Woody Allen. Bartlet and his press secretary C.J. Cregg both say it on The West Wing, also during Season 4. At least one of the lines Sorkin used this past Sunday appears to be his own: “it seems to me that more and more we’ve come to expect less and less from each other,” he said, “and I think that should change.” That line’s from Season 2—of both The West Wing and Sports Night, Sorkin’s previous TV series. (It’s not the only line that showed up on both shows.) Or I suppose we should say it’s from Sorkin’s 1997 convocation speech delivered at Syracuse’s College of Visual and Performing Arts, since that’s when he used it first (as far as I know). To be clear, I don’t think there’s anything wrong with Sorkin reusing some of his best material. As Lynn Greenky, a Syracuse professor of communications and rhetoric told Chelsea DeBaise, a commencement address falls “under the category of epideictic, or ceremonial rhetoric,” like a speech by a politician that, as we all know, will get repeated many times—whether that politician is real, or, perhaps, exists only on TV. * Though Sorkin doesn’t remember the name, I’m pretty sure it’s Dylan Walsh, who was cast as the lead in Hell Camp, Milos Forman’s “comedy about an American-Japanese love affair in the world of sumo wrestlers,” which the director abandoned in the fall of 1991, after the Sumo Association of Japan decided not to cooperate with the production.